Talking about grief is necessary for grief reconciliation. If we don’t talk about our grief we bottle it up inside and that is not good. Grief experts tell their clients to write and talk about grief. Indeed, letting grief out and speaking about it can be a goal. Bob Deits, author of “Life After Loss,” thinks we should tell one or two people about our grief each day. “Tell anyone who will listen to you about your loss,” he advises. He thinks we should tell as many people as we can and not be hesitant about giving our feelings the correct name — grief. Brook Noel and Pamela D. Blair, PhD, discuss the value of sharing loss in their book, “I Wasn’t Ready to say Goodbye.” They think telling others what happened is “one of the most challenging aspects of grief.” In 2007 I lost four loved ones, my elder daughter, father-in-law, brother, and former son-in-law, within nine months. I decided to write and speak about my grief. 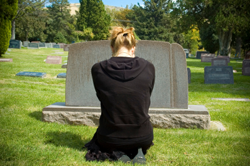 Are you ready to speak about your grief journey? If so, I have some tips for you. Plan well. Though planning is easy for me (and it may be for you), it still takes lots of time. Arrange your talking points in a logical sequence. Limit the amount of information you include. Too much information can be a turn-off for listeners. Have a main message. You should be able to state your message in one sentence. This sentence is essential to planning. If you can’t state your message in a sentence, you may be trying to pack too much information into the talk. Add laughter. Speaking about a sad subject doesn’t mean you can’t laugh. In fact, laughter helps people to remember information. I try to include three funny stories in a 15-minute talk. Think carefully, and I’m sure you can come up with stories of your own. Each story should illustrate a point. Check word choices/flow. You may speak from an outline or print out your entire talk. After you have planned your talk, leave it alone for a week or two. Then go back and check for word flow. Do you stumble over a sentence? If so, think of a substitute word or phrase. Keep it short. In my experience, short talks — no more than 25 minutes — are the most successful. Listeners can remember the points of a short talk more easily than a long one. Short talks allow time for questions. Of course, continuing education and conference talks will be longer. Practice. Two and a half years have passed since my loved ones died, yet I still cry occasionally. Rehearsing my talk again and again helps me to control my emotions and get my message across. I enjoy speaking to groups and the time may come when you do, too. The ability to speak about grief is an indication of progress. You are living a new and productive life. Congratulations! Harriet Hodgson has been an independent journalist for 30 years. She is a member of the American Society of Journalists and Authors, the Association of Health Care Journalists, and the Association for Death Education and Counseling. Her 24th book, “Smiling Through Your Tears: Anticipating Grief,” written with Lois Krahn, MD, is available from Amazon. Centering Corporation in Omaha, Nebraska has published her 26th book, “Writing to Recover: The Journey from Loss and Grief to a New Life.” The company has also published a companion resource, the “Writing to Recover Journal,” which contains 100 writing prompts. Please visit Harriet’s Website and learn more about this busy author and grandmother. own. Acupuncture is another natural treatment for inability to bear a child. pressure to the P6 pressure point area on your wrist.